Created by Bercy Chen Studio and located on a rehabilitated brownfield site, the Edgeland House is where modern meets the past. The house was inspired by the Native American pit house, one of the oldest types of house structure in North America. What’s characteristic for this type of building is that it’s built into the ground. The purpose was to use earth as natural climate control. This way, the house has thermal comfort during the entire year. 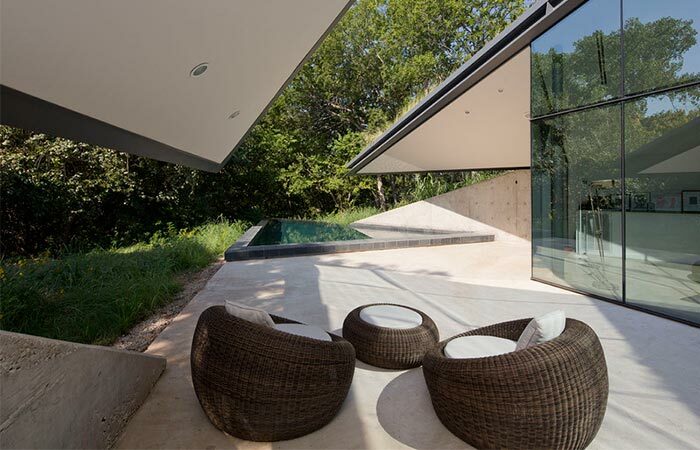 Edgeland House was designed by Bercy Chen Studio and located on the shores of Colorado River in Texas. At the same time, the idea was to create a maximum efficiency house as well. In order to achieve that, the structure combines hydronic heating with a green roof. It’s built into the ground for the purpose of creating natural climate control. The house has two separate pavilions, one being for sleeping and the other one for the living area. It was designed for a science fiction writer. 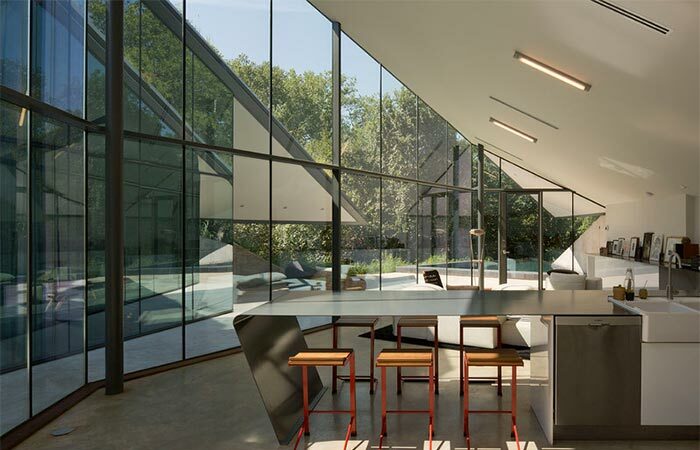 Both sides of the house provide a view of a triangular infinity pool. 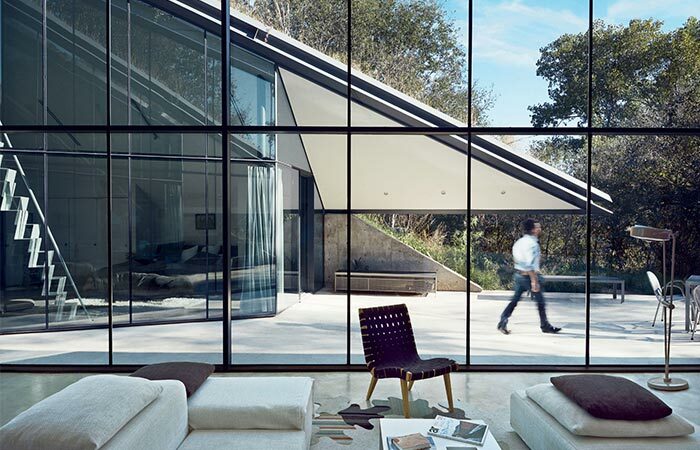 The house features two separate pavilions with green roofs. It has a modern interior and a unique, triangular pool. With a pool that looks nothing like a standard one and a building that is very original, the house can also be viewed as an art installation as well as an extension of the landscape. The structure is surrounded by natural landscape and a river on the one side. The location of the Edgeland House is authentic and indeed beautiful. It’s right on the shores of the Colorado River in Texas and surrounded by natural landscape. 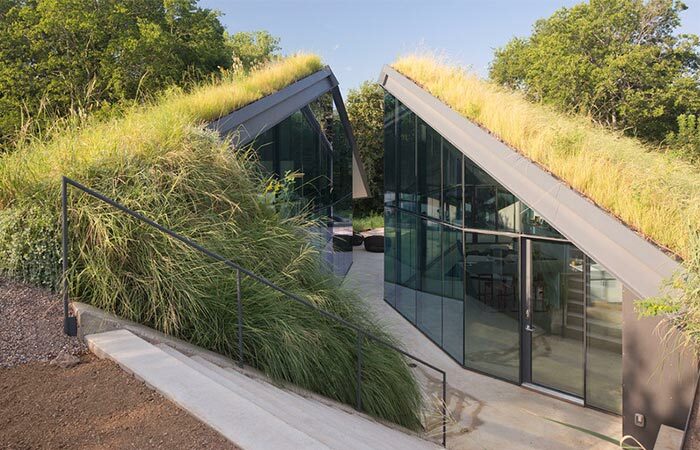 For this project, the studio collaborated with a Lady Bird Johnson Wildflower Center. Together they filled the area with around 40 native species of plants and wildflowers. Both sides provide the view of the pool.